It looks like activity will soon return to the Lan-Yair site. As many of you know, they closed Lan-Yair with the promise of bringing in a huge mixed use development complete with new nig box commerical and about 500 new homes of all types. Well, the new plan seems to be similar, but without the residential component. The article from the HJ doesn't give us much information. Infact, there haven't even been any proposals submitted to the City yet. So my excitement must remain low at this point. 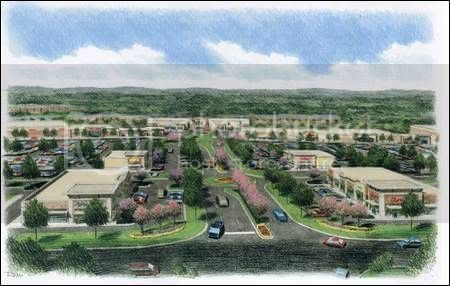 "the Village at Pelham, the $290 million, 200-acre urban village-style complex that is scheduled to open in Greer in 2010 - minus the residential development planned for the Greer site. Yeah, there have been rumors about an Eastside Target for a long time. I don't like to deal with pure speculation, but given this evidence I think its safe to say "Target." Note that there is what appears to be residential parcels in the top right. Possible extension of Webber Road into the site and to Plainview. Not really a "Town Center"
This does look like it will be a nice shopping center (power center), but comparing this to real "town center" developments is just asinine. This will be good for the Eastside, which is in dire need of some other shopping outlets, and more importantly a new theater! Very exciting. I like that this will extend some roads and create new ones to help with traffic flow. The last thing we need is for something of this scale to cause unnecessary congestion on the Eastside. I wish this could have been a mixed use urban village, but I think in spite of that, it still looks like a nice shopping center, and a good project overall- just so long as they don't try and sell this thing as something its not. Oh, Target, please! I hate that Wal-Mart. And if Kohl's, Best Buy and either Barnes & Noble or Borders would build over here, I would be SO happy! It could even be one of the smaller Best Buys that I've been reading about. Good news- this will be a lot more than just a commercial development. Like the original plans several years back, this development will have a large residential component, with 420 units total. Its not the 500 from the original development, but its just as good, IMO. The commercial and residential components are being developed separately. Centennial American Properties will do the commerical, Johnson Development will do the residential. Here is the article from the HJ. a mix of national and local retailers. There are apparantly several commited national retailers, but they wont release their names at this point. Exciting stuff for retail on the Eastside! Johnson is doing the apartments, another developer will do the homes, and you will be very pleased when you hear who. I've heard a rumor that Target or SuperTarget might locate there (I seriously doubt it would be a super target). Borders or Barnes and Noble (Books A Million may be more likely- there was a rumor a while back that they were looking in the area. There are about half a dozen outparcels that are available in that area that have yet to be filled... lots of potential for restaurants. There is a good article in the HJ today on Easton. This will be a first of its kind lifestyle center for the Upstate- being that it is a lifestyle center that has commercial and residential components, according to the article. And, to my knowledge nothing like this exists in the Upstate at this point in time. However, Anderson has a similar project planned (Rosewood) (we have a thread on that development). There is also the large project in Greer (Dillard Creek & Creeckside Village) that is similar in scope to this development. They compare this project to the Shops at Greenridge in Gville, but with a residential component. 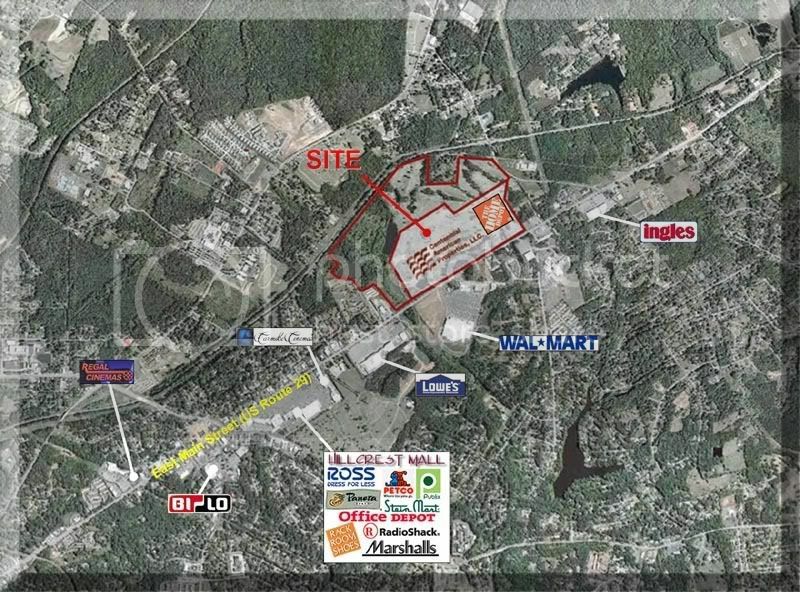 So, it might be a little conceited to think that Spartanburg is the only place planning such a development. Anyway- the biggest news is that there is REAL movement on this project. Not just talk. City Council will consider Monday the first of two readings to form a multi-county industrial park, parntering with Union County. This designation would save a lot of money on a lot of things (for example- they have to relocate some Duke Power Transmisison lines. They stress that this is not a done deal yet. I am just excited to see something happening with this site. "There are plans for water features, bicycle and walking paths, sidewalks and greenspaces. 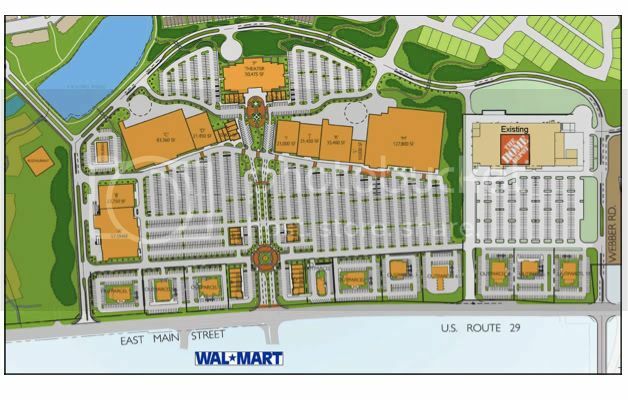 Easton MarketPlace residents will be able to walk to the shops." ^These types of projects appear to be all the rage now and seem to be taking SC by storm. I would like to know exactly who decides to purchase residential units in these developments, though. I'm not talking about residential that just happens to be situated next to a shopping complex; those can be found all over the place, not just the Upstate. I'm talking about residential that is part and parcel of these huge mixed-use developments. Developers love to market them as true "live, work, play" communities, but the average person that works at a store or restauarant in one of these developments typically cannot afford to live there, especially if we're talking about luxury apartments and the like. One major difference here is that the Eastiside has a lot of wealthy residents, but it does not have any decent apartment complexes. The ones that are there are all old (>10 yrs) and lack the amenities that people want today, so there probably IS a market for them- especially if the Hillcrest area is going to have enough retail locally to where driving to the Westside is no longer necessary. After looking briefly at the site plan, it looks like it would be a great place to live. It looks like there will be enough green space between the retail and resedential. i also like all the water features. I hope this works out. it will be great for the Eastside. I will be suprised if downtown ever reaches the point where it can support the type of retail we are seeing on the Westside or Hillcrest areas in my lifetime, or anything remotely close (not that I wouldn't like to see that happen). Its only just now happening in Charlotte, and they have about as many people within a 5 miles downtown as we have in our entire county (minus about 50k). I think downtown will be relegated to niche market and specialty stores, restaurants, bars, and other retail much like Greenville's has for the forseeable future. Its not necessarily bad, its just not the livable urban downtown that I would like to see. As far as Easton goes, it has a lot of good qualities, but I really wish it were more of a new urbanist developmenet than a generic lifestyle center. It will be great for the Eastside though, no question about it. Assuming this gets built- what you do think the impacts will be on Hillcrest? There are 2 movie theaters that stand to be abandoned, which will pretty much kill Converse Plaza, and I have no idea what they would do with Carmike other than turn it into a dollar theater. Hopefully the retailers moving to Easton are new to the Eastside, and will not result in leapfrogging of existing retail in Hillcrest. Seems to me that traffic won't get any better, though to their credit, it looks like they are going to connect Webber Rd to Plainview through this thing. My answer was, the same people who would live in any other residential next to retail. My point was that weather or not the are part of the same project really doesn't make a difference. My only quam is that the residenital and retail components are still very much separated. I don't know how effective this will be at attracting walking customers. If it does, it will only be from those living in Easton. Lifestyle centers are not effective at attracting walkers. They can sometimes get people out and walking around- but I haven't seen any serious long term benefits. Lifestyle centers are not effective at attracting walkers. They can within themselves, but not from surrounding neighborhoods- at least not with the design they have selected and its location in Spartanburg. Even Hillcrest- a much older shopping center- if they are successful in retro fitting it into a lifestyle center, isn't in a position to attract pedestrians or bikers except from the Hillcrest neighborhood on Old Charlotte Rd, which is not very big. The only shopping areas in Spartanburg that have any potential, IMO are those on N Pine, Asheville Hwy/Church St, older parts of Reidville Rd, and older parts of Ezell (near the old Home Depot (market commons?). This is based on where I know that their are a lot of well connected neighborhoods reasonably near shopping, and where I think it could happen the easiest. Converse Heights and Hampton Heights are too far from areas that would be used in that context. They are more suited for more urban style shopping nearby. Even Hillcrest- a much older shopping center- if they are successful in retro fitting it into a lifestyle center, isn't in a position to attract pedestrians or bikers except from the Hillcrest neighborhood on Old Charlotte Rd, which is not very big. Technically, I suppose you are right, but realistically I don't think many people are going to do that at this point in time. Fernwood I could see if you are going to Hillcrest. Most of Hillbrook is too far from anything and too spread out to walk to anyplace, in my opinion. The lack of sidewalks in neighborhoods on the Eastside is frustrating in that regard. Agreed. Village at Sandhill in Cola, and Town Center in Mt Pleasant are also good examples. City Council has approved changing the zoning of two pieces of property next to the Lan-Yair site to "neighborhood shopping center planned development district" in anticipation of the Easton development. 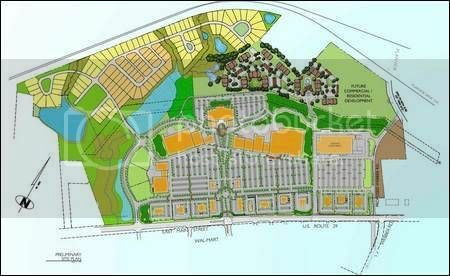 The 188 acre site will be considered for annexation on August 6. I'm guessing that these are the couple of houses accross from Walmart.